Do you feel tired or experience frequent pain in your body? Do you suffer from mental distress? Do you often have disruptions in your sleep? Well, then, be careful because such problems may not be due to simple distress or tiredness but may actually be due to Fibromyalgia. In case you are not aware of what it is, let me tell you that Fibromyalgia is a chronic syndrome that leads to widespread bodily pain and mental distress. It has become quite common with around 2% of the population of US adults suffering from it as per “Centers for Disease Control and Prevention (CDC)”. Still, many of us are not fully aware of it and mistake its symptoms with arthritis or joint inflammation. And today in this post, we are going to discuss in detail about Fibrositis – right from symptoms and causes to remedies for treating fibromyalgia naturally. And today in this post, we are going to discuss in detail about Fibrositis – right from its symptoms and causes to how to treat fibromyalgia naturally without medicines. Fibromyalgia or Fibrositis is a serious health concern and needs to be addressed as fast as possible before it drives you to depression or lowers your quality of life majorly. Awareness is seriously important and hence this post where we are going to discuss everything worth knowing about Fibrositis, including its symptoms, possible causes and remedies. I will explain all the possible symptoms, causes and remedies to treat Fibromyalgia fast and naturally. An individual suffering from Fibromyalgia may face a lot of complications. Starting from a greater number of hospitalizations to making the person depressed to increasing the probability of death by injuries or suicides to increasing the chances of getting affected by other rheumatic conditions like osteoarthritis, rheumatoid arthritis, ankylosing spondylitis and systemic lupus erythematosus etc. Fibromyalgia surely does not let the person lead a normal happy life. So, the early it is taken care of, the better. However, to get rid of it, you need to at first identify whether you are actually suffering from it or not. I have already jotted down the common symptoms of Fibromyalgia. Listed below are a few of the symptoms of fibromyalgia. Take a look. Well, the above-mentioned symptoms are very common in case of Fibromyalgia. However, an individual may face some additional symptoms as well. These symptoms are rare, but many a times accompanies Fibromyalgia. So, it is advisable to be aware of them as well. Now, that you know the possible symptoms of Fibromyalgia, it is important to learn about the causes that may lead to this problem. That way we might be able to prevent its occurrence in the first place. Fibromyalgia is actually a problem where the central pain is processing in the brain and there may be an increased perception or sensitivity to pain to a certain trigger. Sadly, researchers have not been able to find out any specific cause behind it. So, it is a little difficult to understand what actually leads to this chronic disorder. However, some possible explanations have been made regarding the causes that are listed below. According to this study, women are 9 times more likely to suffer from Fibromyalgia than men. As per another study, it is more frequent with women suffering from premenstrual syndrome. Other causes seem to coincide with the onset of menstruations where there is dramatic drop in the hormone levels. It is said that decrease in estrogen levels during menstruation may actually trigger the occurrence of Fibromyalgia in them. Age is another important factor that needs to be considered. It is most commonly diagnosed between the age of 20 to 50 yrs. The risk tends to increase with age. However, as per a survey conducted by the Academic Department of Rheumatology at King’s College, London in 2010, it usually takes an average 6.5 years from the onset of the Fibromyalgia symptoms to finally get recognized as Fibromyalgia. Stress is considered to be a precipitating factor for Fibromyalgia. Although there is no full proof behind this but it is believed that psychological stress may actually trigger physical symptoms, either somatically, psychosomatically or both. Similarly sleep related problems are also associated with Fibromyalgia. While certain sleep problems can contribute to chronic fatigue, some other sleep problems like for example sleep starts and broken sleep are thought to be a result of neurotransmitter dysfunction in the central nervous system. Genetics is believed to play an important role in the development of Fibromyalgia symptoms. This is evidenced in part by study reviews from Chonnam National Medical Hospital located in Korea. Even though research is ongoing, we have got evidence that individuals having the so-called 5-HT2A receptor 102T/C polymorphism may have a higher risk of getting affected by Fibromyalgia. What are the effective medical treatments for Fibromyalgia? Now, that you have known about the possible symptoms and causes behind Fibromyalgia, it is important that you at first check whether you are suffering from Fibromyalgia? And then if results do suggest that, then it is advisable that you start the treatment without delaying. However, there are no such single pill that you can use to treat Fibromyalgia. What you actually need is a multi-faceted approach that may include over the counter and prescribed medications, counseling, physical therapy, lifestyle interventions and complementary therapies. In short, treatment varies from individual to individual. However, I have discussed below about some of the possible medications of Fibromyalgia that you may consider and see whether things get better for you or not. OTC pain relivers- Some OTC pain relivers like for example Tylenol, (acetaminophen) and nonsteroidal inflammatory drugs like Aleve (naproxen) or Advil (ibuprofen) may actually help you out by providing you short-term relief of less pain. Prescribed pain relievers- You may also consider the prescription pain relievers like Voltaren (diclofenac) or Celebrex (duloxetine) that are approved to give long lasting benefits. Antidepressants- For many, antidepressants work well and ease the pain and the feeling of fatigue. They help in uplifting the mood of the individual by raising the levels of serotonin in the system. Some of such approved antidepressants are Savella (milnacipran) and Cymbalta (duloxetine). Anticonvulsants- Anticonvulsants like Lyrica (pregabalin) are approved to be effective in the treatment of Fibromyalgia. Others for example, Neurontin (gabapentin) may be prescribed off-label. In case of sleep related issues, they are usually treated with low-dose antidepressants like for example, Elavil (amitriptyline) instead of sleeping pills. Muscle relaxers like Flexeril (cyclobenzaprine) may also be effective as they alleviate muscle tensions by helping a person have proper sleep. Just as I said that treatment of Fibromyalgia actually varies from person to person. For many, the medications are not at all beneficial. In fact, in a study by Jessy and Julie Rasch Foundation, it was seen that certain medicine are not at all effective and they can also have side effects that makes it really hard to maintain them. In such a situation, natural remedies may actually work. I have jotted down some of the possible and easy to implement natural remedies to treat Fibromyalgia that you may like to consider. I am hopeful that you will definitely see the improvements in case you apply these natural remedies correctly and diligently. So check them out. Getting enough sleep can definitely help you reduce the painful symptoms of Fibromyalgia. You will be able to fight the problem of fatigue that accompanies Fibromyalgia. Studies have clearly shown a link between Fibromyalgia and poor sleep quality. The researchers asked for the development of sleep strategies in order to aid individuals suffering from Fibromyalgia. Avoid drinking alcohol and coffee before bedtime. The idea is to fall asleep and sleep well, so try whatever works for you and that helps you get sound sleep. Although exercise may seem difficult in the beginning, but if you are still able to continue exercising, it may actually bring plenty of benefits in treating Fibromyalgia. The strength of your muscles will improve and so, the pain and the discomfort will decrease slowly. Studies have already shown that doing aerobic exercises on a regular basis like for example walking, swimming or cycling etc. 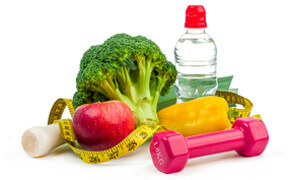 can actually lead to an improvement in the health-related quality of life for the people affected with Fibromyalgia. Another neurological study concluded that a 15-week exercise partly reversed an usual type of activity in the brain that otherwise affects Fibromyalgia patients when the brain is at rest. There was also a significant decrease in the severity of the symptoms. Therefore, we can safely say that doing regular exercise is probably one of the best natural ways to reduce the symptoms of Fibromyalgia. However, it is advisable that you consult your doctor and your physical therapist before starting your exercise regime, especially the tough ones. As per National Center for Complementary and Integrative Health (NCCIH), the scientists are considering and are investigating on the effectiveness of the dietary supplements in relieving the symptoms of Fibromyalgia. So, you may consider these and see whether things are working in your favor. Many also recommend using topical products that contain capsaicin, the substance present in bell peppers making them hot. However, more evidence is required to prove all these to be effective. So, it is advisable that before taking any supplements you consult your doctor otherwise the supplements may interact with your other medicines or cause adverse side effects. As you know already know that stress actually increases the symptoms of Fibromyalgia, so you need to try our means to deal with your stress better. I have jotted down some ways for combating stress. You can also try out other means to keep your mood uplifted. We have published a detailed post on how to reduce stress that you may like to check. Acupuncture is one of the best natural remedies for treating Fibromyalgia. It is actually a traditional Chinese practice where the practitioners insert needles in the specific trigger points in your body that often improve several health concerns. In the case of Fibromyalgia, it is believed that the needles change the flow of blood and the chemical levels which in turn help to relieve the pain and discomfort associated with Fibromyalgia. Although more research needs to be done, but some studies have shown low to moderate evidence that acupuncture can be helpful to Fibromyalgia patients, such as improving the pain and the stiffness in the body. So, it is advisable that you give it a try. Massage therapy can be very effective way to deal with sore muscles and joints. It involves manipulation of your body in a gentle manner to increase range of motion, promote relaxation, reduce stress and relieve pain. Studies have shown that with 5 weeks or more massage therapy, you can actually get relief from the pain, anxiety and depression associated with Fibromyalgia. So, it is definitely worth trying. One study has found out that flotation and spa therapy can give you temporary relief from the symptoms of Fibromyalgia. The participants in this study received 3 free float sessions. In exchange they solved a questionnaire. It was seen that the participants reported temporary reductions in the pain, stress, anxiety, muscle tension and sadness. They also reported a significant increase in relaxation, energy, feelings of wellbeing, quality of sleep, and ease of movement. Hence, we can say that there is definitely a positive link to trying out flotation and spa therapy with reduction in the Fibromyalgia symptoms. In the biofeedback therapy, people actually use special equipment in order to monitor the change in the brain activity in response to certain specific situations and events. This helps to become more aware of what causes or triggers the discomfort and accordingly, changes may be made to help individuals control the discomfort. Now, this particular technique may be helpful for people suffering from Fibromyalgia although more evidences are required to confirm it. Over to you: how do you deal with Fibromyalgia? Fibromyalgia is a common but a complex kind of a problem. Firstly because we do not have very specific list of causes of Fibromyalgia, although gender, stress, genetics and age are believed to be the possible reasons. Secondly, the treatment of Fibromyalgia varies from person to person. So, you will never know which one is effective for you unless you go through all the possible remedies to treat Fibromyalgia. In other words, you may take time to recover in case your initial treatments fail you. 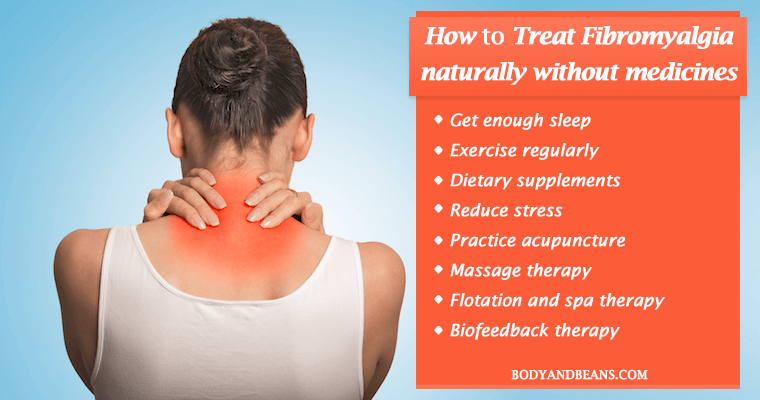 However, I have tried to explain the most common symptoms, causes and remedies that can help you to treat Fibromyalgia fast and easily. So, hopefully, it will make you a little more aware of this complex chronic disorder. As far as the remedies to treat Fibromyalgia go, it is obvious that doctor will prescribe you medications. So you got to check whether things are going in your favor or not. But then, there is no harm in trying these remedies to treat the symptoms of Fibromyalgia. I am sure that something or the other will definitely work in favor of you. So, that is all I had to share with you regarding Fibromyalgia, its symptoms and possible remedies to treat Fibromyalgia naturally. Feel free to share any other remedies of Fibromyalgia that you may be aware of. And finally, if you find this post to be valuable, please like, comment and share it with others so that we can reach out to a greater number of people. However, I do thank you for all your support till date. Hope you all will continue supporting us in future as well. Until then, stay happy and fight the problem of Fibromyalgia bravely.